As every device or machine needs to optimized and cleaned regularly, especially for a computer the maintenance is a must required, a tuneup utility definitely helps you in fixing upholding the situation. TuneUp Utilities 2013 is an excellent 1-Click Maintenance tool for PC users who want complete control over all the installed programs and services. TuneUp Utilities 2013 has ample options and powerful new features to make sure your PC doesn’t slow down rather keeps in top condition. It may be not the strong competitor for top PC cleaners, but many of the users and experts recommend trying it at least once. It has Windows 8 OS compatibility. The improved and robust features gets rid of hard-to-remove registry errors, invalid entries, shortcuts and other data clutters quickly within few seconds of just one-click. It identifies the applications that eat-away more system resources and space and improve the speed and performance. TuneUp Utilities 2013 performs a deep analysis of your system and decides performance-issue areas such as Registry, Startup/Shutdown, Disk fragmentation, etc. After that it starts cleaning and optimizing those areas in quick time. Take a look its latest and improved features. TuneUp Disk Cleaner 2013 (New) – A complete 1-Click maintenance solution which works effectively in removing temporary data, unnecessary files and invalid entries that may be critical at some point. TuneUp Browser Cleaner 2013 (New) – Deletes complete data traces like cookies, cache, etc. from web browsers and secures your online identity. It can remove about 25 internet browsers at a time. TuneUp Live Optimization 2.0 (New) – Gives real-time performance at maximum potential by optimizing the programs which consume more system resources than needed that will slow-down your PC. It even deactivates over data-usage applications and adapts to the situation that assure better performance. TuneUp Shortcut Cleaner 2013 (Improved) – Removes complete list of broken shortcuts and recently used programs safely without affecting system performance. TuneUp Registry Cleaner and Registry Defrag (Improved) – A complete solution for PC registry problems and structural defects. TuneUp Program Deactivator (Improved) – Deactivates unnecessary programs which reduce startup and shutdown times and ensures rapid performance. Economy Mode – To enhance Laptop, netbook and tablet PCs battery life and improve power consumption. Turbo Mode – Turns off 70 invisible high-resource applications on your PC which improved system and gaming performance rapidly. Drive Defrag – Increases disk performance by reducing delays and accelerating startup times. TuneUp Undelete – It prevents data loss on power failures and recovers deleted files, provided if you check the backup and file recovery options. TuneUp Shredder – Deletes sensitive data one time for all safely protecting users’ privacy. 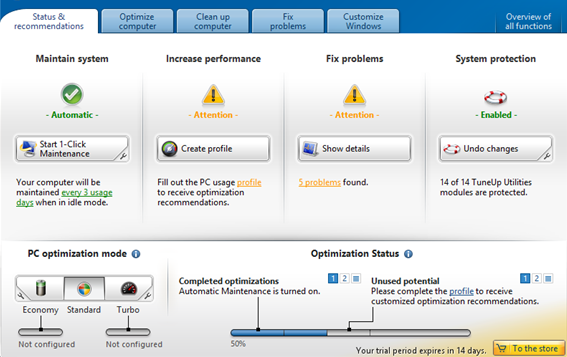 Analyze and troubleshoot your PC – Push the performance-level to maximum with diagnostic tools and recommendations. Personalize Windows – Customize your operating system themes, icons and logon screens with Tuneup Styler and System Control. Automatic updates and optimization report. TuneUp Utilities 2013 is a great choice for beginner and intermediate users who would handle less programs and applications. The 15-day free trial is truly very annoying as it is not sufficient for novice and midway users. You have to buy Tuneup Utilities 2013 for $29.95 which is not affordable for normal PC users. You can download the trial version from below download link.